Welcome to the Lugarno Progress Association! We are proud of the history of our beautiful suburb and value the contribution made by LPA members over the many years that the Association has been operating. We want to keep the Association fresh with new members, new ideas and the enthusiasm and passion that comes with different people working together in community. We have quarterly bush walks around the suburb with local historians describing the sites of Aboriginal inhabitation as well as the early settlers oyster farming and timber cutting sites. We get involved in Clean Up Australia Day and National Tree Planting Day to mention just a few opportunities to beautify Lugarno. Our monthly meetings are held on the first Monday evening of the month unless it happens to be a public holiday when it is held on the second Monday. Look for the banner displayed near the Chivers Hill shopping centre to remind you of the next meeting. We meet at Grandviews Bowling Club on Forest Road, Peakhurst at 7pm. We have a variety of guest speakers coming along to keep us informed about various topics. Come along as a visitor or join the Association so you can vote on resolutions. Either way you’ll meet some of the locals. Please feel free to talk to some of the Committee members about things you’d like to be raised at meetings or to offer whatever skills you have to the running of the Association. There are many things we’d like to do around Lugarno, but we need the expertise of the locals to help! We’ll soon be putting links to some history of the area on this site so watch this space. Download a Membership Application or call into the Pool Shop for a copy. 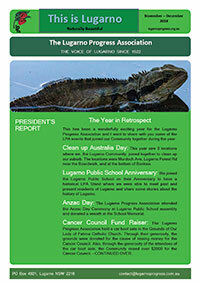 Help keep Lugarno beautiful by joining Lugarno Progress Association and getting involved. Venue: Club Grandviews, 821 Forest Road, Peakhurst. Download the November-December 2018 issue. LPA membership fees fall due in February. Fees are $15 per year or $30 for three years.